Description: Five years into ConRail, and GP35 3673 still wears it's "heritage" livery (and WELL!) as it leads westbound SPSE at North Becket. Description: So it was the day I caught this OISE rolling north just beyond the US 46 bridge in Ridgefield Park. Weather doesnt keep me home!! 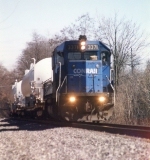 Description: Conrail ran everything on the Chicago Line with 4 axle power, as did PC and NYC before it. This train is no exception, seen rolling past the Dewitt Amtrak station.